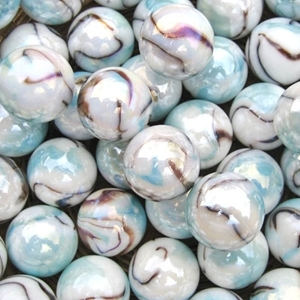 These White Tiger boulder marbles are opaque white with swirls of black and turquoise on the surface of each marble. They have been iridized to give them a shiny, reflective surface. They are approximately 1" in diameter. These boulders are sold in packs of 12 or 125. Sizes may vary slightly. Warning! : Choking Hazard. This toy is a marble. Not recommended for children under 5 years. Assorted - Fancy Mix 9/16"